If teachers decide to use the aquatic biosphere experiment, they should begin that first and make sure that students design a perturbation experiment that will stress the ecosystem in some way. Students can then make the leap to the stressors on ocean health. This activity relies on experimentation and manipulation of real data. Are human activities setting the stage for a mass extinction as has occurred in the past according to the fossil record? 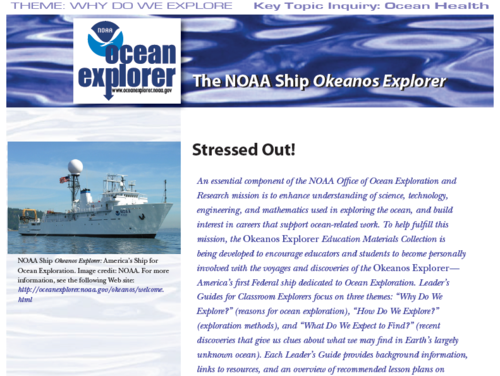 Comments from expert scientist: It is really well presented, and this activity covers really important ocean health topic. Good combination of practical and more theoretical activities. The core of this lesson is to have students research a ocean health topic and then present their research to the class. One of the two optional activities include presenting in the specific format of a scientific poster. Instructions are included for the poster presentation. The other optional component is to make aquatic biospheres and then perturb the biosphere in some way to collect data. The teacher will need to carefully review the materials to make sure connections are made between the experiment and the activities. The lesson is lengthy and complex, requiring instructors to carefully review the steps and decide which options best meet their needs and the needs of their students.